This is a view of the Handcross recreation ground after the Great Storm looking northwards towards the school. 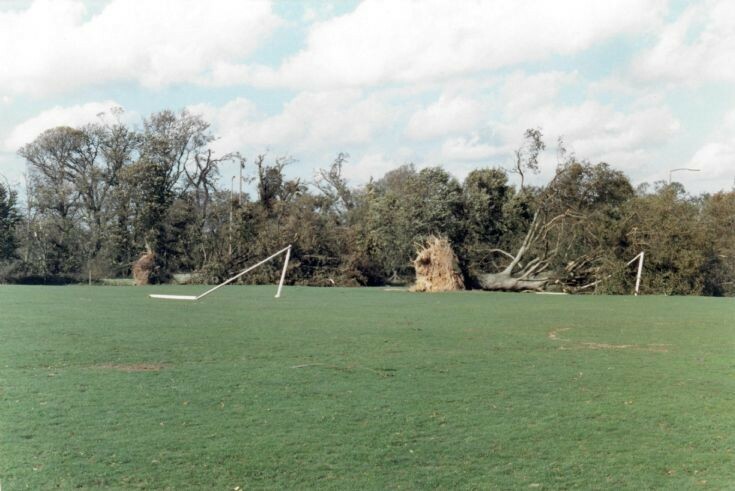 A huge beech tree has flattened one set of goalposts, and the other set appears to have suffered identical problems from the wind alone. There used to be a hedge running across the recreation ground broadly from the Balcombe Lane junction heading westwards. It later became a row of isolated mature trees, and I think the Great Storm more-or-less wiped out what was left of the original hedge. This same storm ripped through the Hyde. It took part of my mother's roof off her house in Horsham Road. There is a Handcross football team picture with this tree in the background and A23 backdrop. It holds a few memories as under the tree, one Guy Fawkes night in the late 1970s, a bonfire was built and lit. I'm sure it was the same night that Roger Ray was orchestrating refreshments and fireworks and a few Catherine Wheels were nailed on the wooden swing frames. One failed to ignite; too damp! I have a good memory of Graham Manthorpe as he was in the crowd where the bonfire took place.